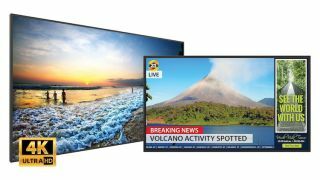 The What: Leyard and Planar have launched the Planar Simplicity Series 4K, expanding the Planar Simplicity Series line of LCD digital signage displays to include five new Ultra HD models. The What Else: The Planar Simplicity Series 4K comes in a wide variety of sizes (43, 55, 65, 75, and 86 inches), and feature built-in speakers and integrated signage tools, such as USB playback with scheduling and LAN distribution, eliminating the need for third-party hardware. They feature a quiet, fan-less design, and feature native 4K resolution at up to 60Hz to support smooth video and mouse tracking. “We’ve expanded the Planar Simplicity Series LCD display line to address the growing need for simple, robust, and affordable signage displays that fully exploit beautiful and engaging 4K content that is now so readily available,” said Steve Seminario, vice president of product management, Leyard and Planar. The Bottom Line: Designed with simplicity and affordability in mind, the displays deliver superior image quality and video performance, enabling Leyard and Planar to meet the full range of signage needs with the Planar Simplicity Series. The displays are well suited for retail, museums, corporate communications, quick-serve restaurants, and small companies with a limited budget that would like to capitalize on the benefits of digital signage.